2019 Spring Trip - NYC!!! Download the letter from the Directors about this event. The show will feature performances by our Cadets, JV and Varsity Winter Guards. Each guard will perform their 2019 productions twice for the Sprayberry community. The guards are preparing for the Southern Association for Performance Arts (SAPA) circuit championships in Chattanooga, TN. SAPA Championships will be held on March 30th and 31st at the UTC Arena in Chattanooga. Please come out and help support this amazing program! Every student who is traveling must attend along with at least one parent. We will give final details, distribute the itinerary, and complete permission forms and medical forms. A full showroom displaying top brands such as Simmons Beautyrest will be available to test as well as adjustable bed systems too! Factory direct prices with savings of up to 50% off retail price in all sizes and mattress types. Credit cards, checks, cash, and on-site financing will be available. Profits support this outstanding program so come out and help the kids and enjoy a better night's sleep as well. Students need to pick up packets of flyers in the band room from the Directors. Please pass them out to neighbors, relatives, local restaurants and everywhere! Please visit and share the Facebook page for the event and view the YouTube video! Time to get rid of your old busted mattress and realize a good night's sleep! Large Group Performance Evaluation, or LGPE, is almost here! Each of our three bands has prepared a concert consisting of three selections of varied style. We will be evaluated by 8 judges and a clinician, and will receive extremely valuable feedback that we will use to improve for the coming years. LGPE this year will be held at McEachern High School in the Performing Arts Center. Each band will perform their concert, and will then receive a clinic and participate in a sight-reading event to evaluate their understanding of musical concepts. Symphonic I Band will perform on Thursday, March 14th in the evening, and Symphonic II and Concert Band will perform on Friday, March 15th. The schedules for each band are listed below. Please take a time to familiarize with the details and the times for each band. Symphonic II and Concert Band Members will miss some school for this event. All absences are excused. We encourage the students to acquire and complete their work ahead of time so that they do not fall behind academically. We invite all of our families and friends to attend as many of these concerts as you can! It is amazing for our students to perform for a large, energetic audience. They have worked extremely hard and are excited to show off what they can do! Remember: We must have a signed permission form for each student! No form, no LGPE! Contact Membership Admin with any questions. The Sprayberry Band Booster Association (SBBA) exists to support the band program at Sprayberry High School. You do not sign up to be a member, and there are no dues. All parents and guardians of students involved in the concert bands, marching band, color guard, winter guard. and jazz ensemble are automatically members, as are the students themselves. Booster Association general meetings are usually held on the third Tuesday at 7:00 pm at SHS. At the meeting, you receive information from the Board and the directors, hear committee reports, receive financial updates, and have an opportunity to take an active part in band activities. Come out and support both Varsity and JV Winter Guards for the SAPA competition at Mill Creek High School! The 2018 marching season is over, but, as always, we will have a fantastic lock-in to close out the year! We will be partying all night long! All the kids (and parents) worked so hard and had a great marching season, and now it's time for some fun. We will be having our annual Marching Band Lock-In on January 19! ALL SHS MARCHING BAND STUDENTS ARE ENCOURAGED TO ATTEND! Sprayberry High School Concert Band, Symphonic I, and Symphonic II bands will perform at Kell High School Thursday, November 8, 2018 at 7:00 pm. Band of Gold will be competing at the North Georgia Marching Band Championships Saturday, October 27, 2018. The competition will be held at the South Forsyth High School War Eagle Stadium. Ticket price is $10/person and can be purchased at the gate on the day of the event. Children up to age 4 are free, ages 5-10 are half off. Gates open at 5:00 pm and the event starts at 6:00 pm. Sprayberry Band of Gold performs at 6:40 pm. Cobb County Exhibition is a wonderful event that has been occurring for many years in our District. It is an opportunity for our County Bands to see each other’s shows in a non-competitive environment and to receive comments from qualified adjudicators to help guide the growth of the band. To achieve this, the County runs two Exhibitions where half the bands perform for each other on each night with a college band performing at the end of the event. It is a fantastic event that is a wonderful opportunity for our students. Our Exhibition is on Monday, October 15th. The 35th Annual Southern Invitational will be held on Saturday, October 20th, 2018 on the campus of Sprayberry High School in Marietta, Georgia. The address for Sprayberry High School is 2525 Sandy Plains Road, Marietta, Georgia, 30066. 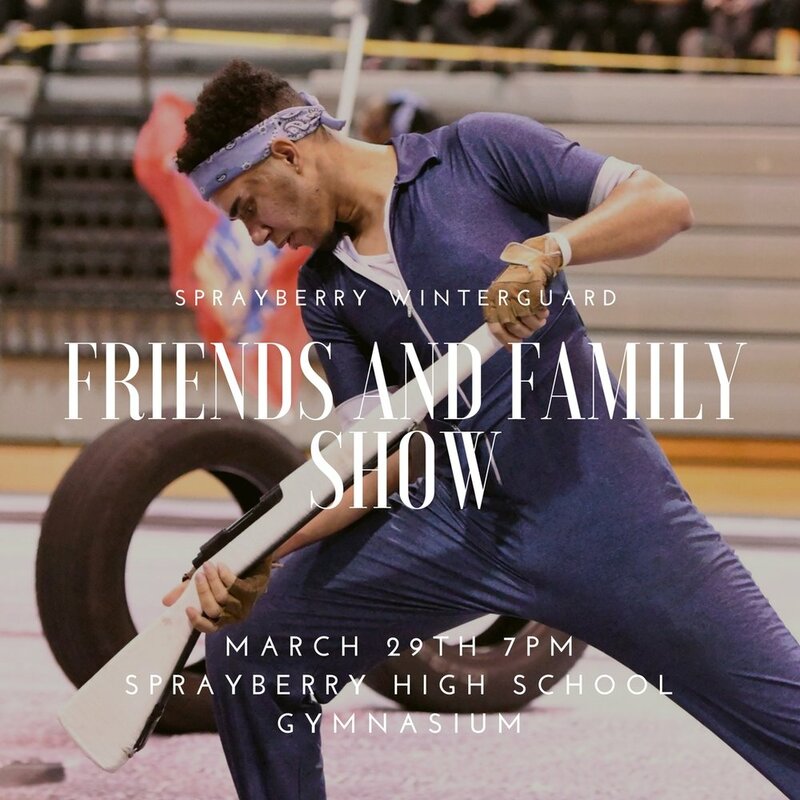 You are invited to attend our annual Winter Guard Friends and Family Show. The show will feature performances by our JV and Varsity Winter Guards. Each guard will perform their 2018 productions twice for the Sprayberry community. The guards are preparing for the Southern Association for Performance Arts (SAPA) circuit championships in Chattanooga, TN. Championships will be held on April 7th and 8th at the UTC Arena in Chattanooga. The Varsity guard will continue on the following week to compete in the Winter Guard International World Championships in Dayton, OH on April 12th-15th. In addition to the performances, SBBA will be hosting a 50-50 raffle, selling Winter Guard spirit wear and Autobell Gift Cards. The Autobell gift cards is a direct fundraiser for the Winter Guard Program. Donations: The Parents will also be accepting non-perishable snacks for the Varsity Guard for their trip to Dayton. The kids will need lots of snacks for the long drive and time at the hotel. Every little bit helps! Join us for the 2017 Winter Concert on Monday, December 4th at the Lassiter Concert Hall 7pm. The Winter Concert will feature selections from the JJ Daniell 8th grade band, Sprayberry Concert, Symphonic II and Symphnic I Bands. Join us for our Marching Band Picnic and Preview Show. The Band of Gold will have a Mini-Camp rehearsal from 10-5:30pm. There will be a preview performance of their 2017 Production "Immortal Reign" at 7pm in Jim Frazier Stadium. All band classes (Symphonic I, Symphonic II, and Concert Band) are referred to as “Concert Band” (CB) due to the fact members of the three bands will present several concerts throughout the year. The meeting includes all band classes: Symphonic I Band, Symphonic II Band, Concert Band, and Percussion Methods Class. We strongly encourage all parents to attend. We will discuss important events on the calendar and review student expectations regarding details about the program. We will also be collecting important Cobb County forms, and we will be collecting band fees. Get a head start on registration and print/fill out the forms below. Post Band Camp is our opportunity to take a breath, digest band camp and have a few more rehearsals before school begins. Once the school year starts we will be on our weekly rehearsal schedule. The post camp rehearsals are in the evening which gives the students time to rest during the day. Post Camp will only occur on Monday, Tuesday and Thursday. Bring a water bottle and snack if needed. The 2017 Band of Gold will begin Pre-Camp beginning July 12th. All students in the marching band are expected to attend all band camp dates. More information about the camps will be published as we get closer to camp but read the items below to make sure you are prepared. Bring a water bottle and make sure you eat breakfast. All Students should bring a packed lunch for Pre-camp and band camp. There will be one or two Pre-Camp Activities after rehearsal on July 12th & 13th from 5:00-7:30pm. These activities may include swimming or some other group activity. These are TBA. Registration is the process of committing your student to join the 2017-2018 Sprayberry Marching Band of Gold. Families will also learn how parents can get involved in the Program through volunteer opportunities, fundraising, spirit wear and more! All Marching Band students (this includes Color Guard) are required to complete forms annually. All forms from previous years will be shredded at the end of each school year. All forms are due by the first day of Band Camp. Bring a water bottle and make sure you eat a snack before arrival.